December 7 to 10, 2011 Shanghai International Trade Fair for Automotive Parts, Equipment & Service Suppliers (Automechanika Shanghai), which co-sponsored by China National Automotive Industry International Corp. and Messe Frankfurt (Shanghai) Co., Ltd., was held at the Shanghai New International Expo Center. SINOMACH’s Vice President Wang Songlin, CNAICO’s President Lin Hailin, vice president Ji Xuecheng, Jin Yongjian attended the press conference and communicated with Messe Frankfurt’s Vice President Burrma and Johannes. During the exhibition, the U.S. 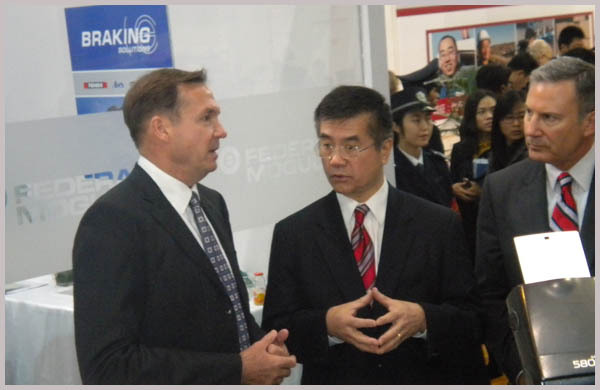 Ambassador Gary Locke also visited the show, and gave a speech in the fringe program ‘the United States Automotive aftermarket Suppliers Association (AASA) China's after market suppliers promote the economic growth conference’. The seventh Automechanika Shanghai created a new recode. The total exhibition area is 16 million square meters, covering 13 indoor exhibition halls and 6 temporary outdoor exhibition halls, which make it the largest automotive parts exhibition in Asia. 3619 companies from 67 countries and regions attended the show. The total exhibitors increased 16% compared with that of last year. 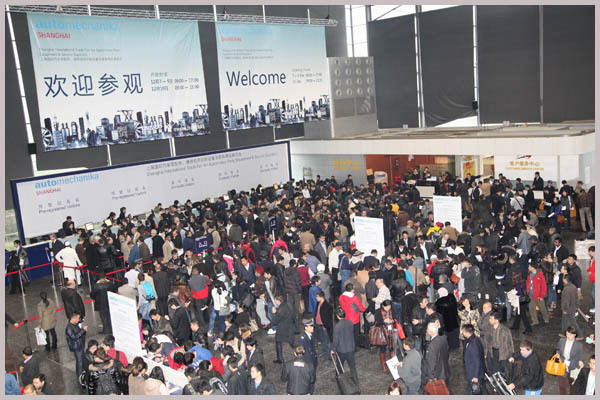 60000 professional buyers from 130 countries and regions visited the show. At the same time, more than 30 fringe programs were planned during the exhibition. More buyer groups appeared in the exhibition this year. The organizers invited 9 international super buyer groups from Australia, Indonesia, India, Iran, Malaysia, the Middle East, Pakistan, Peru and Poland, and domestic provincial buyer groups from Hunan, Fujian and Guangdong. Procurement delegations from BAIC, BYD and JAC were also invited, which attracted a lot of business opportunities for the show. Many well-known companies continued to participate in this show, including Affinia, ArvinMeritor, Changan Automobile, the United States Dana, ContiTech, Dongfeng Cummins, Germany Continental Automotive, the Mogul, Phoebe, Mahler, MANN + HUMMEL, NTN, Matsushita Electric, Philips, TRW, universal, Yuchai, ZF, BorgWarner, Great Wall Motor, Dai, Delphi, Schaeffler, Ramo power, Masahiro industry, Luo's enterprises, Graco, Bosch, Tongrun, Mahathir, S & P Master pneumatic Apollo, Pentium, SPX, Stanley, long-Connaught, Karcher, Kogi, Tigers, Hennessy, etc. In this year, Automechanika Shanghai further improved the quality of fringe programs. The topic of fringe programs covered repair, maintenance, service supplies, new energy, remanufacturing and many other fields, closely integrating with the current industry hot topic, attracting a large number of exhibitors and professional visitors. The high-end seminar theme as “Go Global” invited guests, who are leaders of famous auto parts enterprises from Europe, the Middle East and North America, to introduce the development of auto parts industry, and teach Chinese enterprises how to explore oversea market. In addition, other fringe programs also proceed smoothly, including 2011 Automotive Aftermarket Innovation Summit, Automechanika Match Seminar, 2011 China's commercial vehicle, engine parts, international market development forum and other professional event. The exhibition is on an unprecedented scale, and received remarkable results. The show was not over yet, booth application of next year has started. The exhibition fully showed its industry influence and its role as a platform. Automechanika Shanghai is world's largest auto parts trade shows. Now it’s Asia’s largest, world's second largest professional exhibition. Exhibition sectors include automotive parts, equipments, service suppliers, etc. It has been organized seventh.